The reishi mushroom, also known as Ganoderma lucidum or lingzhi, is used in traditional Asian medicine to treat a wide variety of health conditions from cancer to hypertension. This mushroom, which has become increasingly popular due to the reported health benefits, is available in the form of powder, tea and dietary supplement. This particular mushroom is rich in compounds called triterpenes, which are believed to provide the health benefits. Some side effects have been documented, particularly in high doses and with long-term use, so speak with your doctor before starting this supplement. According to the book "Herbal Medicine: Bimolecular and Clinical Aspects," reishi mushrooms have been studied, with some intriguing results, for their health benefits, including antioxidant properties and improvements to blood sugar, blood pressure, immunity and liver health. Reishi mushrooms have also been studied for their anticancer activity. A 2003 article published in "Integrative Cancer Therapies" reviewed the action of powdered reishi mushrooms on breast and prostate cancer cells, concluding this supplement had anticancer activity, but the precise mechanism of action was not clear. However, human studies are limited. Most of these studies have been completed on animals. In addition, the human studies did not contain a large enough sample size to provide strong results, and the results were not consistent with animal studies. An April 2012 review published in "Journal of Traditional and Complementary Medicine" stated that there are no apparent side effects recorded with the use of reishi mushrooms. However, a study published in the July 2008 issue of "Canadian Journal of Clinical Pharmacology" demonstrated that while the use of G. lucidum, or reishi mushrooms, in cancer therapy stimulated immune cells, large doses were toxic to these same immune cells. The American Herbal Products Association’s Botanical Safety Handbook lists a summary of known adverse reactions, such as rare allergic reactions to the mushrooms. 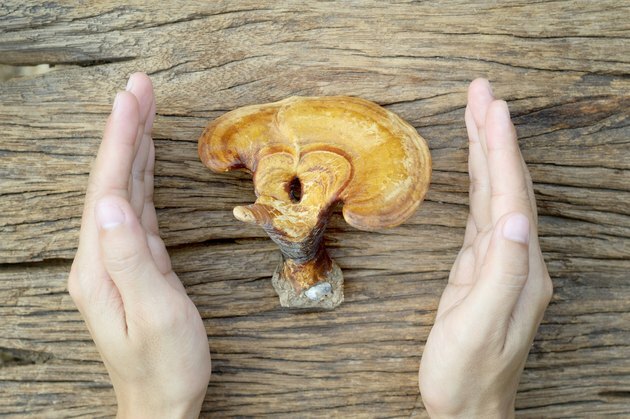 According to this review, reishi mushrooms appear well tolerated, but there is little data on their long-term safety -- as one study links potential symptoms of dizziness, dry mouth and abdominal upset with 3 to 6 months of continual use. Dietary supplements are not regulated by the U.S. Food and Drug Administration. This means that supplement companies do not need to provide proof a given supplement contains active components or that the dietary supplements provide any benefit at all. The article in "Integrative Cancer Therapies" indicated that some of the supplements tested were low in biologic activity and that consumers should be cautious when choosing a supplement. In addition, the extract of reishi mushrooms is often combined with other herbal compounds, making it difficult to determine which ingredient is responsible for any noted benefits. Consult with a doctor before beginning any alternative medicine supplement. Reishi mushrooms can interact with certain medications, and for those on blood thinning medication, reishi mushrooms may increase the risk for bleeding. Reishi mushrooms have the potential to interfere with cancer chemotherapy drugs. Women who are pregnant or breastfeeding should speak with a physician before taking any supplements. There are no specific recommendations on the use of reishi mushrooms for medicinal purposes or for the treatment of any condition. More high-quality human studies are needed to know if supplementation from reishi mushrooms, and at what dosage, is safe and beneficial for human health. Herbal Medicine: Biomolecular and Clinical Aspects, Second Edition; Sissi Wachtel-Galor et al.